With the winter holidays approaching, of course many homeowners around Minnesota are thinking about outdoor lighting. But we’d like to talk about landscape lighting that’s not just seasonal – outdoor lighting that can enhance your yard all year long. Outdoor lighting is an excellent way of transforming your landscape in many ways. Your landscape’s appearance can change with just a flick of a switch when a tactical landscape lighting plan is in place. Your environment can be more secure, and there is potential to increase opportunities for outdoor entertaining. Fixtures and light bulbs installed for exterior lighting need to be rated for outdoor use. Besides rating, consider checking color and intensity of the light bulbs, as these will affect your mood. Bulb tones range from reddish to bluish white. There are many types of bulbs to choose from: fluorescent, halogen, incandescent or LED. Incandescent light is soft and pretty, but the lifespan is shorter and energy use is more. Halogen lights have longer a lifespan and energy loss is less. Fluorescents use less energy, last longer, and have a wider color range. LED upfront costs are more but with their long lifespan (about 40,000 hours) and low energy usage they pay for themselves in savings over other types of lighting. Now onto a landscaping design. Features which are built in should be highlighted first, such as stone benches, ponds, or gazebos. 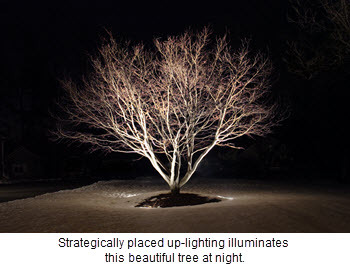 Use floodlights or spotlights for attention to be drawn on accents such as an ornamental tree or shrub. The placement of lights is based on purpose. Down-lighting is use one purpose (lighting that shines underneath the light source), such as lawns, trees, and paths. Another different purpose is served by up-lighting for things such as small plants, architectural elements, or shrubs. Outdoor lighting can make your yard safer at night. It is best to illuminate pathways, driveways, decks, pavers, patios, and doorways for trip hazard avoidance. Glares are prevented on paths or walkways with downlights. Doorways are easily seen with an overhead or light on either side. Riser or tread of steps are lit with stairs. Driveways should have lighting of great length alongside it. Patios and decks may be lit for the designation of seating, railings, or cooking spot. Movement in your yard is freer with the perimeter magnified. Outdoor security lighting based on a motion detector is triggered when a warm body is sensed. The other good option is a timer, but the best systems use both. Whatever type of system you choose, having a manual override is important so that you can turn the lights on when needed. When looking to design your landscape lighting, a MN outdoor lighting contractor can be of great assistance to you. Architectural Landscape Design can help plan and install landscape lighting you are looking for. We are a licensed MN landscape design and installation contractor serving the Minneapolis metro area as well as outlying Minnesota and western Wisconsin communities.